Sanrio's stable of cute characters. In 1960, Shintaro Tsuji founded the Yamanashi Silk Company in Japan. By 1962, he had expanded to selling sandals with flowers painted on them. 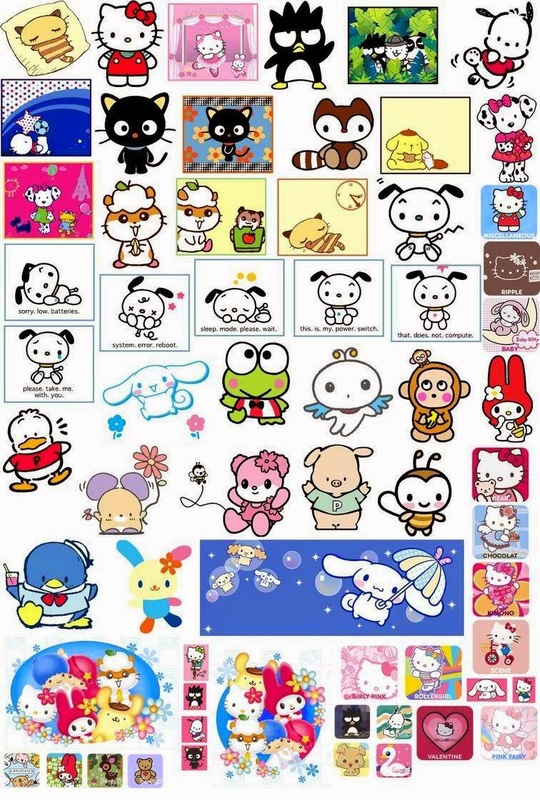 Noticing how well items sold with cute designs, Tsuji hired various cartoonists to design cute characters to adorn his merchandise around gift-giving occasions, renaming the company Sanrio in 1973. In 1974, Sanrio got its biggest creation from Yuko Shimizu: Hello Kitty. 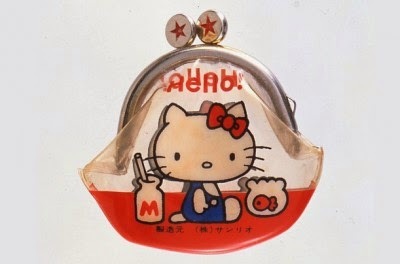 Hello Kitty appeared on a vinyl coin purse between a bottle of milk and a goldfish bowl. She proved an instant success and Hello Kitty continued to appear on a variety of Sanrio products in various themes courtesy of designer Yuko Yamaguchi. The Hello Kitty empire expanded when she was introduced to American audiences in 1976, and gradually around the world. Initially aimed at pre-adolescent females, the Hello Kitty brand was broadened to include products designed for teenagers and adults. Over time, Hello Kitty was given a backstory as Kitty White, a British girl five apples tall with a large family. Hello Kitty was made British because not only were foreign countries trendy at the time in Japan, but they wanted to distinguish her from their other characters who were predominantly set in America. The cast of the theater in "Paws-The Great White Dog Shark." 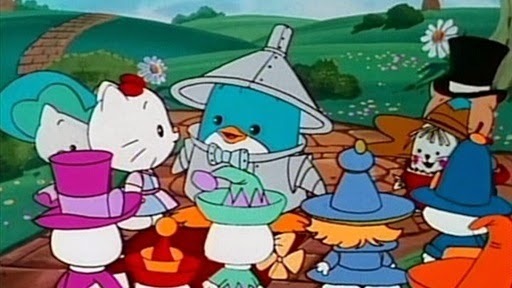 The first time Hello Kitty appeared on TV was, interestingly enough, in an American animated series, although it was a Japanese-American-Spanish co-production. Hello Kitty’s Furry Tale Theater made use of the various themes Hello Kitty was depicted in on her merchandise by centering the series around Hello Kitty (Tara Strong) and her friends and family putting on shows in a theater. As soon as the show began, however, the theater would give way to the actual world in which the story was set (imaginary, of course). Each episode was comprised of two 11-minute segments that were a parody of well-known movies, such as Star Wars and E.T., and fairy tales, such as Cinderella and Sleeping Beauty, complete with Kitty-themed puns in both the episode titles and character names. The episode “The Phantom of the Theater” deviated from the established format slightly by taking place in the actual theater after the show had concluded. One notable difference exclusive to this show was that Hello Kitty was featured with a mouth, whereas in all other places she doesn’t have one depicted. 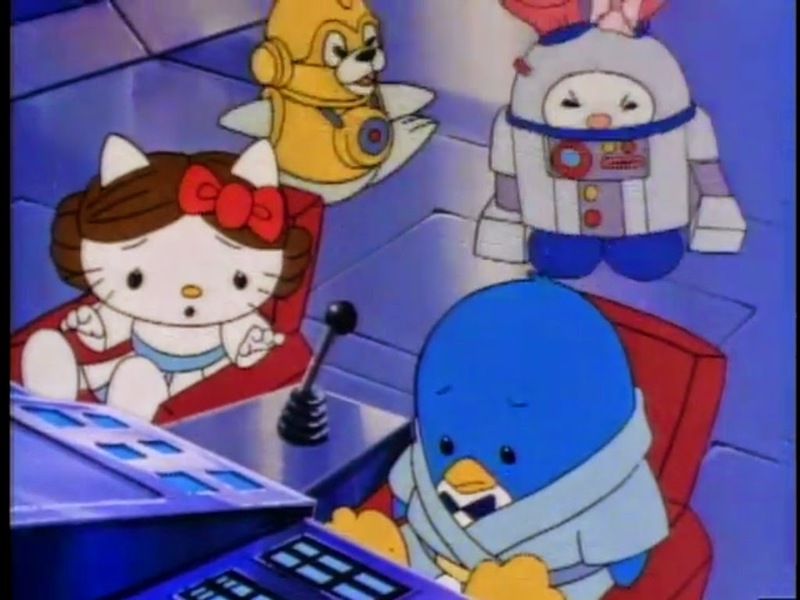 Hello Kitty’s Furry Tale Theater debuted on CBS on September 19, 1987. It was produced by Sanrio, DiC Entertainment and MGM/UA Television and adapted by Phil Harnage. Writers on the show included Harnage, Jack Hanrahan, Eleanor Burian-Mohr, Jim Lenahan, Martha Moran, Tony Marino, Pat Allee, Ben Hurst, Temple Mathews, Matt Uitz and Jack Olesker. The theme was written and preformed by David Pomeranz, while Haim Saban and Shuki Levy handled the rest of the music. 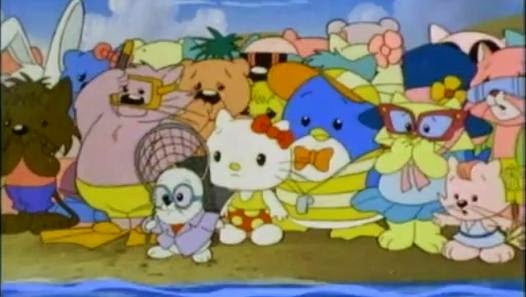 Although the series only lasted one season, that didn’t stop Hello Kitty’s popularity from continuing to grow. Sanrio teamed up with several corporate partners to expand the brand onto other objects like electric guitars and credit cards, music albums, video games, and further television adaptations; eventually leading to the opening of her own dedicated stores. In 1998, MGM Home Entertainment released two VHS collections containing four segments each. Between 2003 and 2004, the series was collected into five DVD collections: Becomes a Princess, Goes to the Movies, Saves the Day, Plays Pretend and Tells Fairy Tales. Each one contains five segments without the show’s opening and closing sequences. Only “How Scrinchip Stole Christmas” wasn’t included. In 2011, the first three collections were collected into a triple pack, and all five DVDs were collected into a single set in 2013. “The Wizard of Paws / Pinocchio Penguin” (9/19/87) – Hello Dorothy tries to get home from the land of Paws after beating the Wicked Witchy / Granpapetto Kitty’s penguin puppet comes to life when he wishes for a son. “Cinderkitty / The Pawed Piper” (9/26/87) – Cinderkitty becomes head cheerleader for the Royals after winning the heart of Prince Purrfect. / The Pawed Piper saves a village from a plague of fleas. “K.T.—The Kitty Terrestrial / Peter Penguin” (10/3/87) – K.T. becomes separated from her parents on Earth and is saved from UFO hunters. / Kitty and Chip must help Peter save Dinglebell from Captain Claw. “Kittylocks and the Three Bears / Paws—the Great White Dog Shark” (10/10/87) – Kittylocks intrudes on the home of the three bears. / A great white dog shark threatens the island of Catalina. “Cat Wars / Tarsam of the Jungle” (10/17/87) – Fluke Penguin ends up recruited to help save the planet Caturn from evil forces. / Hunter Catnip and Bwana Grinder pursue the legendary Tarsam, who was raised by apes in the jungle. “Sleeping Kitty / Kitty and the Kong” (10/24/87) – When Princess Kitty fails to invite Bratnip to her party, Bratnip’s mother curses Kitty to sleep forever when she watches TV. / Originally escaping the clutches of Kong, Kitty helps Kong escape when Catnip takes him to New York. “Kitty and the Beast / Little Red Bunny Hood” (10/31/87) – Fangora and Troll Grinder turns Tuxedo Sam into a beast, which can be reversed if Kitty falls for him. / Grandma Kitty faces multiple problems as Little Red Bunny Hood goes to visit her. “Snow White Kitty and the One Dwarf / Frankencat” (11/7/87) – Dwarf Grinder saves Snow White from the evil queen Catnip. / Dr. Frankencat builds a monster that abducts My Melody. “Catula / Paws of the Round Table” (11/14/87) – Hello Kitty and her friends have to stop Catula from terrorizing Catsylvania. / Sir Lancelot Penguin and Arthur have to retrieve Excalibur from Morgan La Fur and the Black Knight. “Rumpeldogskin / Robin Penguin” (11/21/87) – Kitty spins straw into gold for King Sam while Fangora pushes Catnip to become his queen. / Robin Penguin must jouse Sheriff Grinder to save Maid Kitty. “Hello Mother Goose / Crocodile Penguin” (11/28/87) – Hello Mother Goose helps her friends retrieve what they’ve lost. / Reporters Hello Kitty and My Melody track down the legendary Crocodile Penguin. “Grinder Genie and the Magic Lamp / The Ugly Quackling” (12/5/87) – Kitty and Sam find a magic lamp. / Ugly saves sister Catnip from Grinder Fox. “How Scrinchenip Stole Christmas / The Phantom of the Theater” (12/12/87) – Catnip attempts to steal Christmas. / Mowser the Mouse is responsible for strange goings on at the theater.